Walter Edward Jenkins was born in Wrexham on 21st October, 1879 and christened on 23rd November, 1879. He was the oldest child of Francis (Frank) Jenkins and Hannah Elizabeth nee Dawson who were married in Wrexham Parish Church on 23rd December 1878. They had 11 more children after Walter. From the 1911 census, they had 12 children two of whom died. The ones that have been traced are as follows: Walter Edward 1879, Ann 1882, Mary E. 1884, Eleanor 1888, Herbert 1890, Llewelyn 1892, Louisa 1894, Amelia 1897, Albert 1899, Elsie 1902 and Percy 1904. Frank and Hannah moved house a few times throughout the area. In 1881 they were living in the Moss near to Wrexham with Walter who was only 1 year old. Frank was a Labourer. By 1891 they had moved to Little Mountain, Pentrobin – not far from Buckley and were living with their five eldest children. At that time Frank was a Railway Platelayer. In 1901 the family can be found in Lower Street (Derby Road), Caergwrle. Frank was now a Coal Miner Hewer, and Walter at 21 was a Coal Miner. Walter started school on 18th March 1884 at St Matthew’s National (Infants) School, Buckley. In 1887 he moved onto St Matthew’s National (Boys) School, Buckley, finally leaving school on 12th October 1891 just before his 12th birthday. On 11th April 1901 Walter married Lavinia Williams at the Register Office in Chester. They had 7 children as follows: Elizabeth Ann 1902, Eleanor 1903, Ellis Thomas 1905, Frank 1908, Hever Llewellyn 1909, Amy 1911 and Constance 1914. In 1911 Walter and Lavinia were living in Derby Road, Caergwrle with their older 5 children. Cissie, Nellie, Ellis, Frank and Llewelyn. On this census Walter said he was born in Wrexham and Lavinia in Leeswood. Cissie was also born in Leeswood, but the other four children were all born in Caergwrle. Walter was a Coal Miner Hewer. By the time Walter enlisted in 1914 the family were living at 22 Doe Quarry Terrace, Dinnington, Nr Rotherham. Perhaps they moved there for work purposes. On his Attestation Papers he described himself as a Collier. Some of his military records survive, and they tell us that Walter enlisted at Worksop on 26th May 1915 and came to Wrexham on 31st May. He was 35 years old 5′ 5.5″ tall, weighed 132lb and had a 35″ chest. His next of kin was Lavinia, but her address was altered from 22 Doe Terrace to 4 Coronation Terrace, Caergwrle (Walter’s parents’ address). He was posted to the 3rd Battalion of the Royal Welsh Fusiliers on 3rd June 1915, and was transferred to the 9th Battalion on 4th October 1915. Walter was killed in action on 3rd July 1916 during one of the first Battles of the Somme (from The Long, Long Trail – http://www.1914-1918.net/bat15.htm). 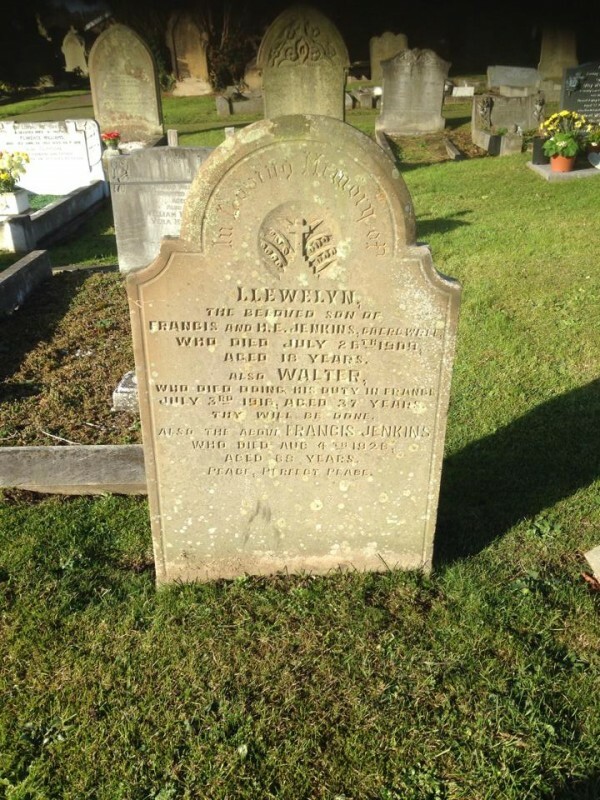 Walter’s brother Llewelyn died in 1908 aged 18 and is buried in Hope Cemetery. Walter is remembered on this gravestone – “Also WALTER who died doing his duty in France, July 3rd 1916 aged 37 years”. His father Frank died in 1928 and is buried in the same plot. A letter from the War Office to Lavinia tells us that she was to receive a Pension of 28/6 for her and her 7 children. Walter is not mentioned on either the Caergwrle or Hope Memorial, or as far as we can tell on any other local War Memorial. However, as he lived in the area for many years and is remembered in Hope Cemetery, we felt his story should be told.